Home » emmy awards , lost , michael emerson , television » Michael Emerson wins Emmy for LOST! Michael Emerson wins Emmy for LOST! I do not watch much television, truth be known. A show has to be mighty impressive for me to invest the time to keep up with it on a regular basis. But I can't recall any show that has so captivated my imagination as has ABC's Lost. 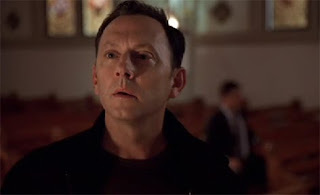 And of all the remarkable characters from the magnificent Lost ensemble, few have been more intriguing than Benjamin Linus (shown here from last season's episode "316" as he shares the story of Thomas the Apostle), played as no one else could by Michael Emerson. Is Benjamin a bad guy? A good guy? Someone with an agenda we can't even begin to imagine? Even now going into the show's final season, Ben Linus is a complete mystery. Last night at the Emmy Awards, Emerson finally got his long-deserved recognition: he won the Best Supporting Actor for a dramatic series. Considering that there is no single "primary" character in Lost, that is certainly something to be proud of. He deserves it. Elizabeth Mitchell is great too!